I have a new paper, co-written with Vincent Geloso, on the measurement of inequality in Wisconsin between 1919 and 1941. The discussion’s geography may initially seem obscure, but there’s a method to this investigation. 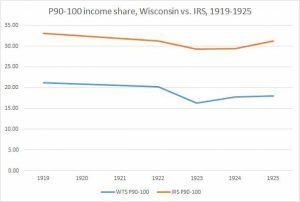 In the early part of the 20th century Wisconsin had a stable state income tax system and, more importantly, generated high quality data about its taxpayers on a semi-regular basis throughout the period. The Wisconsin tax featured low but moderately progressive rates on a scale of 1 to 7%, was applied broadly across the state’s population, and underwent relatively few statutory changes to its tax rates over the period between its inception in 1911 and the end of World War II. Wisconsin’s state income tax contrasts greatly with the federal income tax in the same time period. Federal tax rates fluctuated wildly until the end of World War II. Congress frequently tinkered with top marginal rates. They adopted a low of 25% in the 1920s, but raised them to over 60% in both World War I and the Great Depression era. By the end of World War II, it exceeded 90% on the top income earners. The federal income tax was also notoriously inconsistent in this period. Tax avoidance and evasion were both recognized problems of the system, and the tax base itself was constrained to a narrow set of the population – sometimes even less than 10% of all U.S. households were eligible to pay. This latter decision was in keeping with the tax’s intended progressivity, although it ended with a rapid tax base expansion during World War II that gave us our modern income tax system. The point in contrasting these two systems – Wisconsin and federal – is to show how the structure of the tax code affected the data each generated. For example, Wisconsin’s low rates and broad tax base ensured that it collected tax returns from the majority of Wisconsin households in most years even as the IRS collected returns from a much smaller tax base (these collections predated automatic payroll withholding and were therefore self-reported). During the late 1920s and 1930s, Wisconsin consistently reported a higher overall net income for the state than did IRS figures. Wisconsin also had more tax filers on the local level in every year between 1915 and 1941, when the IRS surpassed them due to the wartime tax expansions. During the 1930s it was not uncommon for Wisconsin to collect 3 to 4 times as many state-level tax returns as the IRS did in the state at the federal level. To make a long story short, all of this matters for purposes of data analysis, including the calculation of income shares and inequality. Thomas Piketty and Emmanual Saez’s article on the historical distribution of incomes in the United States uses federal income tax data from the IRS to compile its estimates. Though their method for doing so is an innovative improvement upon numerous prior attempts to calculate income shares, it still remains highly sensitive to the underlying quality of its tax data source. The Wisconsin tax system therefore has implications for measuring inequality by serving as a point of comparison against the IRS. Since Wisconsin had a more stable tax regime and collected its returns from a broader portion of the population, it is likely a superior data set to the federal IRS records for the reasons mentioned. 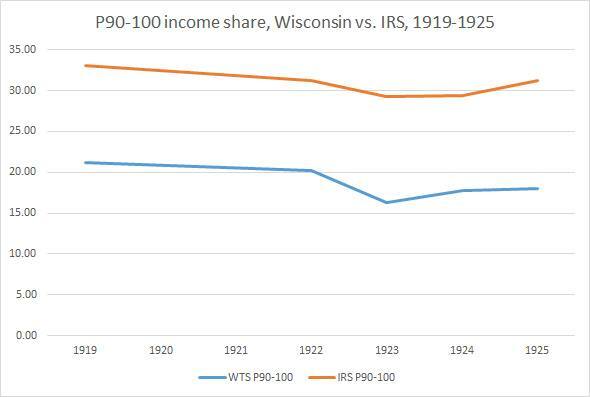 So what happens when we calculate the income distribution for Wisconsin in the 1920s and 30s? If we use the state income tax records as our data source, we end up with very different results than the federal IRS records. In particular, the IRS records tend to show a higher level of inequality than the state records – which is to be expected considering that the IRS primarily collected returns from the wealthiest income brackets whereas Wisconsin taxed the entire state more broadly. A depiction of this effect in the 1920s appears in the graph above, and our full series of generated income shares for the top 10% of earners may be found in the appendix to the paper. 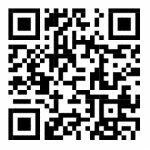 This entry was posted by Phillip W. Magness on Tuesday, May 16th, 2017 at 9:06 am	and is filed under Uncategorized. You can follow any responses to this entry through the RSS 2.0 feed. Both comments and pings are currently closed.